Perhaps one of the greatest challenges faced by society nowadays is keeping up with the ever-changing needs of a globalised economy. For such an economy to succeed there needs to be a workforce of highly skilled individuals. Improvement in education in Malta is thus crucial for the country’s economic success. One of the main objectives of the Ministry for Education and Employment is to equip individuals with the right attributes for the modern workplace. The road ahead is not an easy one. Malta’s national literacy rate needs to be improved, making a National Literacy Strategy vital. Equally important in our bilingual country is the ability to effortlessly alternate between Maltese and English. This talent has played an important part in the success of our economy. Although the ultimate aim of this Literacy Strategy is for the population to be equipped with the necessary reading, writing and oral skills, it also targets the integration of a bilingual policy, allowing individuals to develop dual literacy skills and become proficient in both Maltese and English. Furthermore, the gender discrepancy in literacy skills, which was evident in the PIRLS 2011 study, is also a challenge that needs our focus. Although mixed-gender schooling is well established at primary school level, it is only being introduced at a secondary level in the scholastic year 2013/2014. Middle school for students aged between 11 and 13 is also new. With the introduction of such concepts the educational system will be a more diverse and inclusive one. We aim to offer society a modern approach, which moves away from the traditional military-style educational concepts of the past. We acknowledge that a one-size-fits-all model is not an efficient framework any longer. And we know that when a school develops an identity, based on its local community, it can play an important role not only in a child’s education, but also in his or her upbringing. Early school leaving is another challenge for the educational system and the economy. Through the launch of the Early School Leaving Strategy the ministry is consulting various stakeholders, from employers to educators, to discuss how the EU 2020 targets can be achieved. Although early school leaving rates have decreased considerably, a lot of work still needs to be carried out. Moreover, a common dilemma numerous students encounter following graduation is the inability to meet the skills needed for specific jobs. This drives the need for an educationto-employment system whereby the educator, employer and employee are on the same page. We need a smoother transition from education to employment. We believe that education is not for the young only, but a lifelong process, which is never truly finished. Through a number of scholarship schemes, the government aims to help individuals continue their post-graduate studies and increase specialisation. Through more investment and efficient planning, we aim to empower our society, providing the tools for them to succeed in an ever-challenging modern world. Public spending on education was 3.5% of GDP in 2012. The Ministry for Education Employment and the Family is responsible for basic and higher education in Malta. There are 10 public primary schools and two secondary schools in the country, as well as three further education institutions: the University of Malta, the Institute of Tourism Studies and the Malta College of Arts Science and Technology. There are 11 years of compulsory education starting at age five. Primary school comprises six years and secondary seven. The numerous church schools are subsidised by the government. Some 94.5% of pupils complete primary school (2011). The school year starts in September. A combination of state, private and religious institutions provides for an extensive education system. Church schools are subsidised by government and their tuition is free. Courses at the University of Malta (founded 1592 as the Jesuits’ College) include architecture, arts, diplomatic studies, education, engineering, law, medicine, sciences and theology. G F Abela Junior College (University of Malta) was established at Msida (greater Valletta) in 1995 to provide two-year pre-university courses. Malta College of Arts, Science and Technology offers a very wide range of vocational and professional education, with its main campus at Paola (greater Valletta). 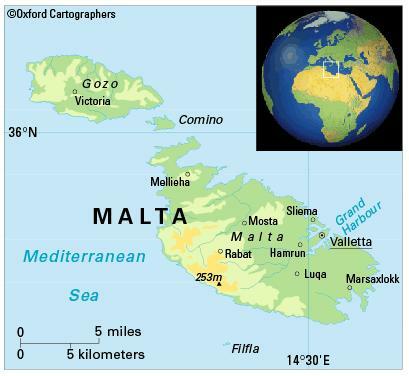 The International Maritime Law Institute is based in Malta. The female-male ratio for gross enrolment in tertiary education is 1.3:1 (2012). Literacy among people aged 15-24 is 98 per cent (2005). The University of Malta is the highest teaching institution in Malta, and one of the oldest universities in the Commonwealth.